Here’s something to chew on. 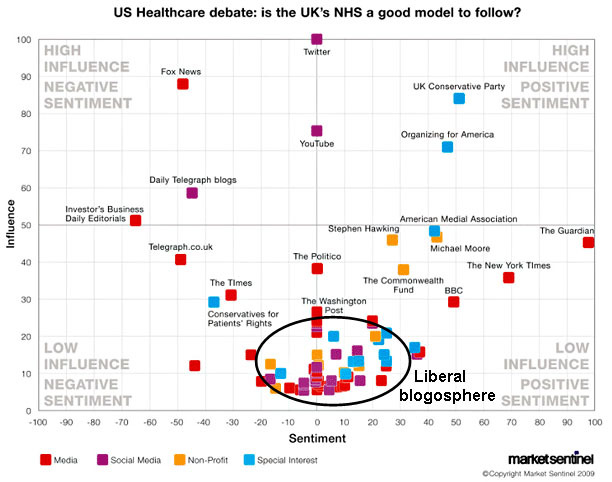 Market Sentinel, a British firm “specialising in online conversation monitoring and analytics,” has canvassed the online media world to see who’s most influential in the American healthcare debate. As a proxy, the issue they surveyed was whether Britain’s NHS was a good model for the U.S. to follow. Their findings: The outlets most favorable toward the NHS are the Guardian and the New York Times. The least favorable are IBD, the Telegraph, and Fox News. The most influential medium is Twitter. The least influential is the liberal blogosphere. That’s bad news for us bloggers. On the other hand, is Twitter really the most influential medium out there? Seriously? And in what way is the UK Conservative Party influential in an American debate about healthcare? For that matter, does trawling the web for references to the NHS really tell us anything at all about how Obama is doing on healthcare anyway? In any case, I’m stumped by their conclusion that this chart shows that Obama “has lost the argument online.” Looks about even to me. And color me a wee bit skeptical of their methodology: “We crawl the internet looking for pages which are about the topic, then we track mutual references between people, institutions, entities mentioned in the context. The resulting structure gives us a mathematically verifiable measurement of ‘authority’ in the context.” You betcha. But what I really want to know is whether Twitter is genuinely the most influential online medium in the healthcare debate. Does that count Chuck Grassley’s tweets? If so, somebody please just shoot me now. Western civilization is doomed. UPDATE: Some good points about this from Tim F. over at Balloon Juice. Comparing all of Twitter to individual outlets makes Twitter look a lot more influential than it really is. And if blogs are nearly as influential as the Washington Post and the New York Times, as the graph suggests, that’s actually pretty good news for the blogosphere, isn’t it?